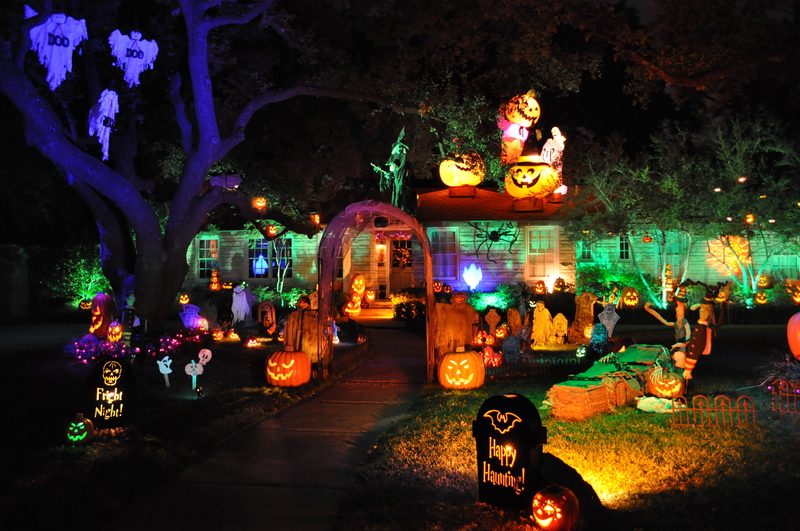 Halloween decorating and light displays are increasingly found in neighborhoods around the country. As the light displays become more sophisticated, you find more Halloween enthusiasts lighting up their home and yard. Here are our top 10 picks for Halloween light displays in 2015. 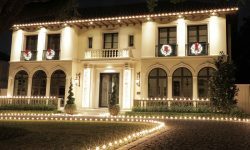 At first glance, the lights display on this house appears to be just a few strategically placed rope lights and lit up pumpkins in the yard. 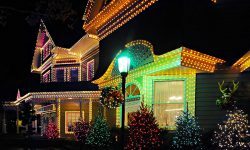 In reality, there were hours upon hours of planning involved to make this light display animated and timed along with the song "Ghostbusters". 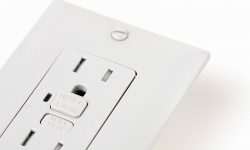 There are four faces that sing to the song, as well as flood lights placed on the corners of the house that are synchronized to the beat of the song. This set-up utilizes not only flood lights of multiple colors but also walkway lights and lights that look like a candle on the rooftop. 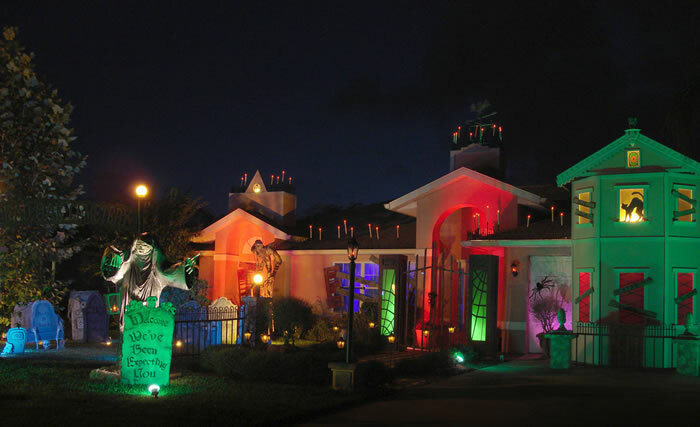 The flood lights are angled to highlight the large yard decorations and create spooky shadows. The walkway lights are not too bright to illuminate the yard, but just dimmed enough to highlight the walking path. Red lights on the porch create an eerie feel while the faux candlesticks on the roof keep the eye looking at the house and weather vane. 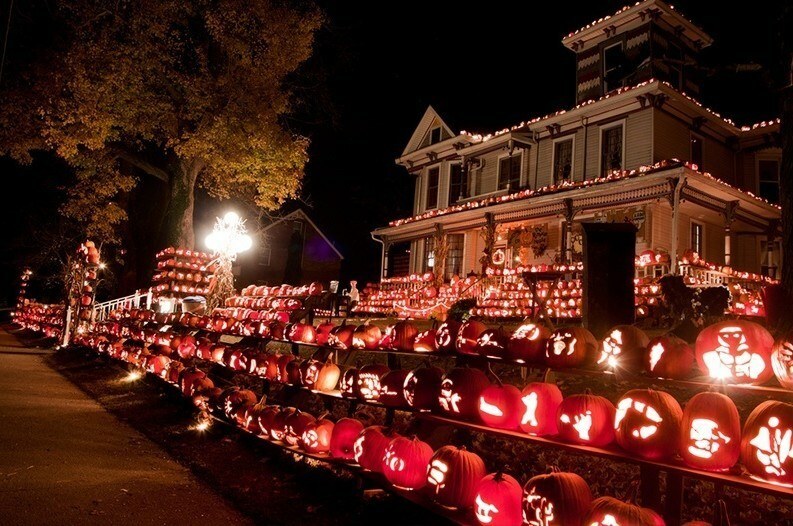 Have you ever seen so many jack-o-lanterns in one place? This home is overrun and lit up entirely by jack-o-lanterns! 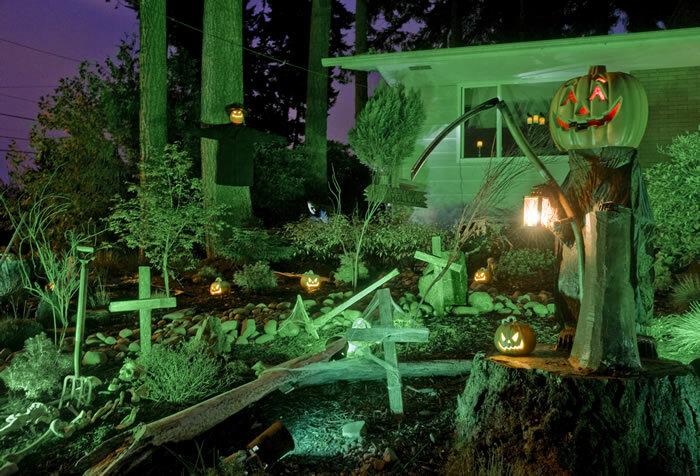 This house used every square inch of yard to create a Halloween scene with flood lights, jack-o-lanterns, tree lighting, and gentle green mood lighting to make it extra spooky. This house has been choreographed by Tom BetGeorge with a giant piano and guitar, singing pumpkins, and gravestones to Disney villain songs. This display has taken a different approach than most. 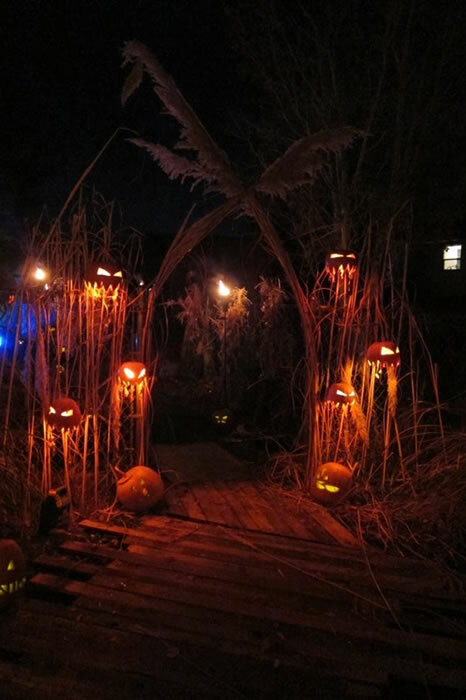 The entryway is lined with jack-o'-lanterns lit up with some normal lights as well as some yellow lights. The dull lights on the stalks of hay illuminate the stalks but do not penetrate them to create a shadow. A single lamp post style light helps to aid walking on the wooden path. 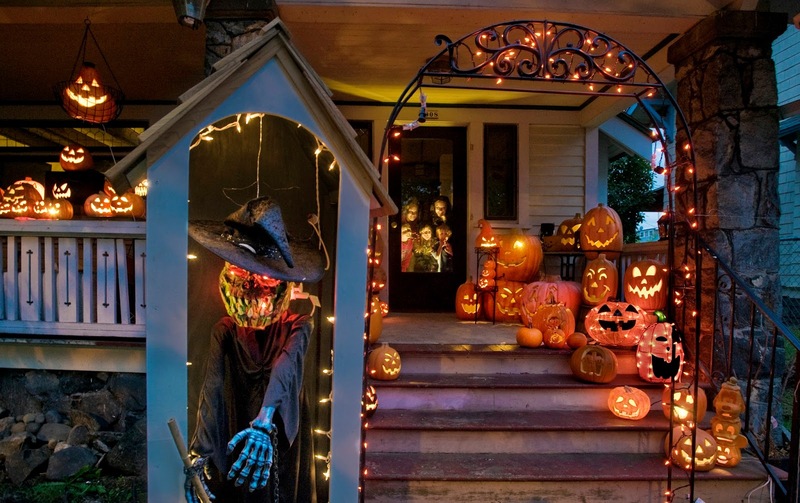 This could easily be created for a front porch or yard, and the jack-o'-lanterns can be carved to each person's liking. 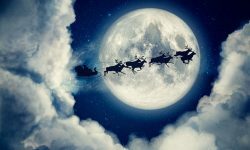 This family in North Canton, Ohio has been decorating their home for Halloween and Christmas since 2010. They are a Toys for Tots drop off site and all donations go to the Akron's Children's Hospital this year. All of the lights on this porch are provided by the jack-o'-lanterns and a few strings of orange lights. There are pumpkins of all kinds collected to provide these lights. 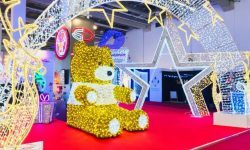 Real carved pumpkins, prefabricated electric pumpkins, ceramic pumpkins, and pop-up fabric pumpkins are all seen in this wild collection. The lighting on this home is understated, but it perfectly accents the great props. A green floodlight provides the main lighting for the ground, and it also creates great shadows, while a few jack-o'-lanterns provide additional light. A brighter light it used for the pumpkin head grim reaper in his lamp, muting the green light on him. A few candles in the window help to draw the eye up to the house where the shadows from the flood light are thrown. 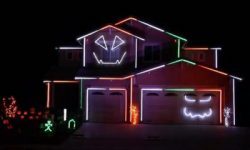 This Thriller Halloween light show speaks for itself. Perfectly orchestrated to the Michael Jackson song "Thriller".